Omaha\Council Bluffs. Am willing to travel outside of metro area however there may be some reimbursement for expenses. Call me to discuss. My services are on a reward basis if item is found. Calls outside Omaha\Council Bluffs area may require reimbursement for fuel expenses, we can certainly discuss. Land and shallow water areas up to 5 feet. Please obtain permission for private property, I can help you with this. City of Omaha requires permit for City Parks any other properties, which I do have. Searching in State Parks is prohibited unless permission is obtained from park superintendant. Hopefully your just checking out the website! If you or someone you know has lost a sentimental item, then you've come to the right place for help. Rachel (my better half) and I have teamed up to make numerous recoveries, you get two for the price of zero. If two isn't enough, I am actively involved with our local metal detecting club. This comes in handy when the search area is large. I have asked and graciously received help from numerous members of our club to locate items. Feel free to contact me by text, email, or phone. I understand that in some situations time is critical, so feel free to contact me any time of day. I was hoping that you could somehow post my message to the website about my recent experience with a ring finder named Tony Reese of Council Bluffs, IA. 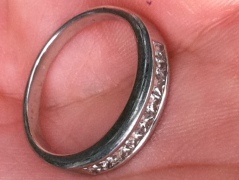 I lost my wedding ring while playing ball in a city park and upon discovering it, I got frantic. I posted a message in the lost & found section of Craigslist thinking that I would never ever see it again. Tony contacted me and told me about his services and although I informed him about the details of my location, I have to admit that I was still skeptical about ever seeing the ring again. Low and behold, he called to tell me that he found it! I cannot find enough words to tell him how much I appreciated his hard work and most of all, his honesty with returning the ring to me. Thank you so much Tony!